Nepal has been named as one of the 10 top travel countries for 2017 by Lonely Planet. This is great news for people of Nepal after the devastating earthquake of April 25, 2015, and after India closed its border for several months. The Nepal economy has decreased tremendously as most of people depend on the tourism industry. In 2017, Nepal hopes to bring jobs to people and hope the economy of the country will take a long step to rise again. If you are from Europe or Western countries, traveling to Asia is completely different experience. Not to offend anyone but if you are European or Westerner, you might feel you are some years back from now. But the culture and experience you will get from Asia will be long lasting, and might change your way of living and perspective of seeing problems. Nepal is very popular as a trekking destination and its landscapes. Mount Everest (the highest mountain in the world), and the birthplace of Buddha are the major attractions which are a once in lifetime experience. Seeing Nepal’s unique architectural style, visiting temples, learning about culture, hiking in mountains, and white water rafting will meet your expectation of adventure. Last but not least are the people. Nepali people are humble, kind, generous and friendly, and you will see many kids playing freely and a lot of women working the land. Interesting daily shocks might include electricity power cuts for more than four hours per day, garbage on roads and lanes, cows in the middle of the road, and women with red colour clothes. Sandal or slippers upside down, three people walking out from home, black cat crossing the road, and whistling inside the home are some of the things which are believed as spiritual bad luck. 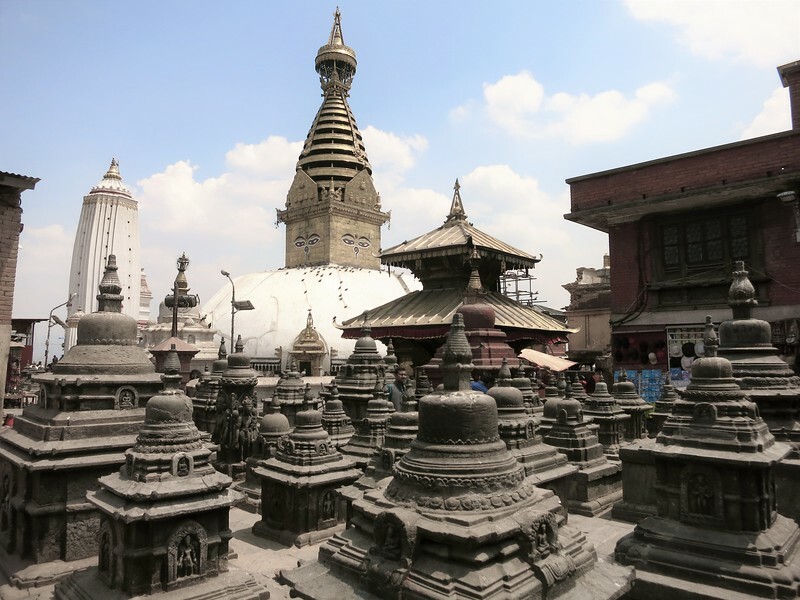 Here are some culture shock when you travel to Nepal. After your arrival, of course you will face people who will offer you taxi or cheap hotel. When you hop into a car and come out from the gate of airport you will see the snake driving of vehicles. There are dividers but the car might go to wrong side to overtake, which is normal and not to worries there are no accidents. Taking a public bus can also become an interesting experience; you may think that is not so bad if taking the bus at the beginning of the station but as the ride goes on, you will find yourself sharing a microbus built for 7-8 people with 50 people, yes you are reading right 50 people….enjoy the ride! If you are lucky you might see on your first day guys holding hand when they are walking. This might give you some other perspective but it not as you might think. Guys holding hands in Nepal means good friendship and brotherhood. People are traditional but educated, and girls and boys dating in city is getting more common but not gay relationship. Arrange marriage system is still there but people are also doing love marriages. Educated people don’t care about dowry system but just to continue religious value. A girls family will share some needed stuff in her new home. If this is your first time in Asia this might be interesting for you. Nepal do have western style toilets but most of the homes are with regular Nepali style. You can experience using toilet doing yoga position and maintaining your balance to drop your stuff into the hole. Nepali people are experts at it but I have heard one foreigner say I will hold it for year but not in this toilet. The next thing is no toilet paper. Most of the people use their hand and water to wash after poo. It is taught from childhood to wash their hands with soap after use of toilet but you never know if you can get soap in every toilet. People in general move out at the age of 18 to 23 in western or European countries, but in Nepal we don’t move out. A happy family means grand parents, parents, you, your partner, and your children living together in the same house. Sons are supposed to be the one who will care for the property. When the daughter gets married she will live in her husbands house with his parents. There are some cases if the house is small or they have far jobs then they will move out, but in most cases you will see everyone living together happily. Sujan Pariyar is an engineering student | Charity adviser | Author | founder of inxchan.com | Social Entrepreneur. He writes about social entrepreneurship and travel experiences. www.facebook.com/jovialdisaster.